It is SO nice to find skincare products that work for you after searching and searching and searching, isn't it? These are all organic products from Organaca that I've switched to using recently. They have completely changed my skincare regimen for the better, therefore it's only fair that I share them with you. This post isn't sponsored, it's just honestly how much I love them! I'm a big fan of using quality organic and natural skin care products. My face has never looked (and felt) better and I can 110% thank these products for this. Organaca has many quality skincare brands and products you can pick from (including makeup, too!) depending on your skin type, but these are my favorites. Since my face can be oily, after I wash my face every morning I use Dr. Hauschka Normalizing Day Oil. At first I was skeptical about putting oil on my face (I'm trying to get away from that, right?) but now I am so glad that I do. After just a week or so of using I've noticed my face is less oily throughout the day. I mean, it's a pretty big difference. After that, I use my holy grail moisturizer, Dr. Hauschka Moisturizing Day Cream, as a base for my makeup. I cannot say enough good things about this moisturizer (!!). The second I put it on, my skin feels "awake" and leaves a perfect glow. It's light, balances oil production, and leaves the skin looking enlivened. If you try one thing from this list, try this. I use the Suki Eye Repair Balm at night all around my eyes. This eye balm is a preventative to stop signs of aging, minimizes fine lines and wrinkles, and hydrates the skin. If you are in need of a good eye balm, this is your solution. Just like our bodies often need a good detox (cough cough..mine), our skin does as well. Next on my list is to try this Suki 21 Day Dermal Detox Kit. I think this would be a good option for those of you who want to try organic products but aren't sure which ones to get. 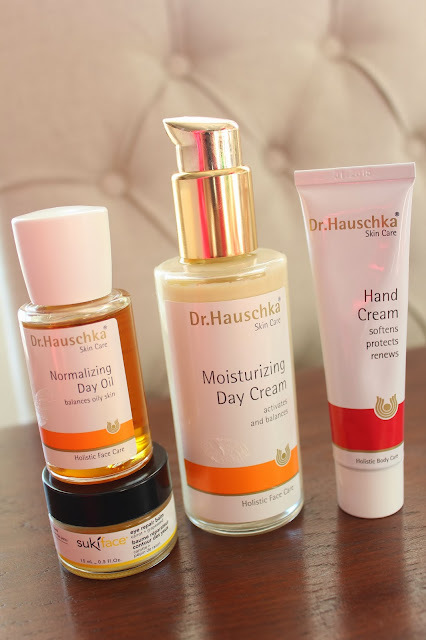 Also, you can't go wrong with any of Dr. Hauschka's products. *get 10% off by becoming an Organaca FB fan or by signing up for their emails. 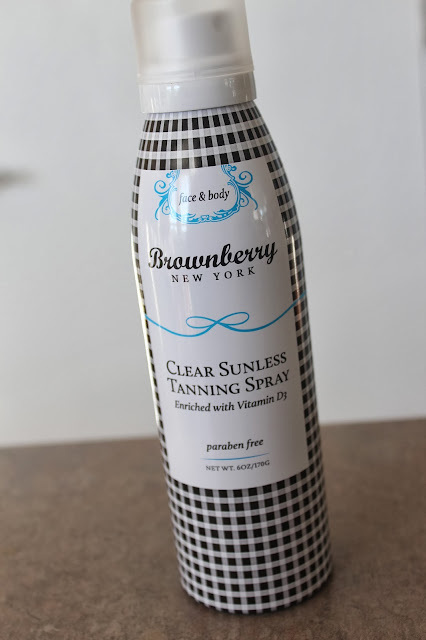 Last but not least, Brownberry's Sunless Tanning Spray is my go-to for the winter months if I don't want to resemble one of the Cullen's from Twilight. It is enriched with VitaminD3, super easy to use, paraben free, and I have a natural glow within a couple hours or by the next morning. I spray it all over my body, let sit for 5 minutes before dressing, and the tan stays for about 3 days. I just recommend standing on an old towel or something so that it doesn't get on your floor. You don't have to worry about it being greasy or turning you orange either. Does it smell? No. Does it stain your clothes or sheets? Negative. Have you tried any organic skincare products before? PS-Enter to win $100 Gas Gift Card here! Do you have problems with the self tanner rubbing off when you work out? I always have that problem! That Brownberry has been on my radar for some time....does it have that tanner smell when your color starts to set in? Every one I have bought has that tanner smell and I read this one doesn't....what are you thoughts? Thanks for the reviews! I am totally drawn to that self tanner :) Does it get on your clothes or sheets? Does it smell? Do you spray and then rub all over? Nope!! It has never got on my sheets or clothes and I've used it for about 3 sessions now. You spray it all over but you don't need to rub it in. These products sound so great! I'll definitely be looking into them! Good!! Winter are on and skin care products are really a need. Hope these products will work well. I agree Melissa. Natural Organic Care products are best because they are made of natural ingredients.